There is no dearth of unsolicited advice bubbling up for Microsoft’s new CEO Satya Nadella. As Microsoft(s msft) forges its cloud path, some (ahem) have opined that it should acquire Red Hat, if only to forge tighter links between Red Hat(s rhat) Enterprise Linux and Microsoft’s Azure cloud. It’s a valid debate and one that can continue at Gigaom Structure next month, when there will be an opportunity to ask Microsoft EVP Scott Guthrie about the company’s cloud plans and the tectonic shifts affecting the cloud ecosystem overall. Last fall’s OpenStack Foundation survey found that 55 percent of OpenStack workloads run Ubuntu Linux as the host OS, compared to 24 percent for CentOS; 10 percent for Red Hat Enterprise Linux and 10 percent “other.” But Wardley, who has his doubts about OpenStack’s prospects, said Ubuntu’s footprint in the giant non-OpenStack public clouds is more important. Wardley’s contention is that Red Hat’s success comes in the old-world of single-server nodes running in company data centers, while Canonical has taken cloud by storm. And that is pretty much verbatim what Canonical founder Mark Shuttleworth told Gigaom recently. In his view, Red Hat, because of its success in enterprise Linux, is tied to an old enterprise sales model that is largely irrelevant in cloud. 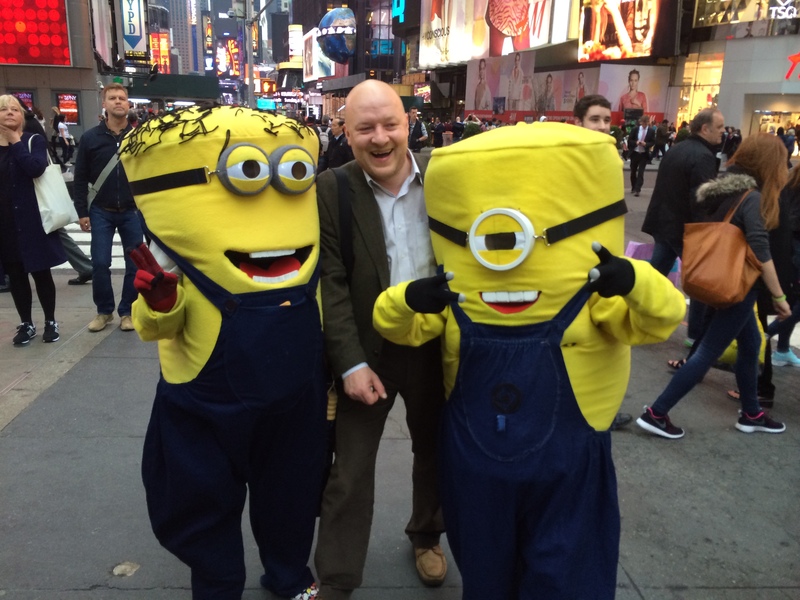 Simon Wardley and minions (Photo courtesy of Brian Katz). In Wardley’s view, Nadella could also parlay Canonical’s mobile expertise now that Nokia is officially part of the company. His recommendation is that Microsoft swap out Nokia’s Android phone for an Ubuntu version. After all now that Microsoft is in the device business, why should it feed into a market pretty much owned by Samsung? Wardley also argues that Canonical’s Cloud Foundry ties would give Microsoft influence on that open-source PaaS effort — something I’m still trying to get wrap my mind around. Anyway, please check out Wardley’s post and feel free to add your two cents here. One thing is clear, Microsoft, with in excess of $87 billion in cash, could pretty much buy anything it wants, so why not speculate? It’s worth pointing out that Wardley actually worked for Canonical as their Cloud VP 2008-2010, see also http://uk.linkedin.com/in/simonwardley. It’s not the first time he’s speaking out in favor of Canonical against Red Hat, and his arguments are usually reasonable. thanks. i had forgotten that he had worked at canonical. you are little late for april fools. No good could possibly some of MS buying Canonical. This is interesting as a discussion of strategy, one which I hope does not happen. Is there any supporting evidence for a theory that such talks are proceeding? meetings? industry reports? leaks? Without such evidence, it’s just a discussion. As the story states, this **is** a discussion started by simon wardley. No leaks that i know of. No … really no. Microsoft has bought other software companies before e.g. FoxPro, only to “embrace and extinguish” now a shadow of its former self under the name of Visual Studio and MS Access the king of the hill. Ubuntu would die a slow and painful death if sold to Microsoft. For us, it’s moving away to another Debian-based distro. COREL was another victim of Microsoft’s “embrace and extinguish” COREL Linux was one of two distributions that people could buy off the shelf, that were snuffed out, the other was Caldera – aka SCO. It is not, and has never been, in Microsoft’s commercial interest to see ANY operating system out there other than theirs. Microsoft buying Canonical would turn me off to Ubuntu completely. How sad. Microsoft is the touch of death for me. I hope it doesn’t happen, really. Microsoft, who has been having backdoors to the NSA in their OSs, buy Canonical?! Please no. Micro$oft would be the end of Ubuntu. I’ve already been leaning in the direction of Mint and CentOS. Micro$oft would put the fork in it for myself. They would ruin Ubuntu Linux. Hell, they don’t even understand their own products, how can we expect them to understand something as fundamentally different as Linux? I’d move on. Microsoft is actually a big supporter of open source both as contributors, donating money, and also by supporting their products with their hosting solutions. MS is better off not bring any of these companies in house and stick to partnering with them. Interesting arguments. I think the most important counter argument is that most likely a lot of the users of Ubuntu (and possibly Canonical employees) would rather move on to something else than take orders from Redmond. That could kill all of Ubuntu’s momentum. On the other hand, perhaps the people who deploy Ubuntu “in the cloud” would welcome the cooperation. Everyone else would probably leave Ubuntu. GOD NO! I have little love for Canonical, but keep MS the hell away from Linux! What are they going to do? Put a “Metro” skin on a Linux core? No they’re not. They were a kernel contributor because they mantained drivers for their Hyper-V technologies. That’s different from getting his crap into the mainline kernel.